Perfect for a party or movie night, these loaded nachos will leave your drooling. Drain and add cashews to a blender, along with the other cashew cheese ingredients and blend. Make the guacamole by mashing the avocado with the juice of a lime. Chop and add a handful of red onion to the guacamole. Season with salt and pepper, a sprinkling of coriander and mix together. Set aside. 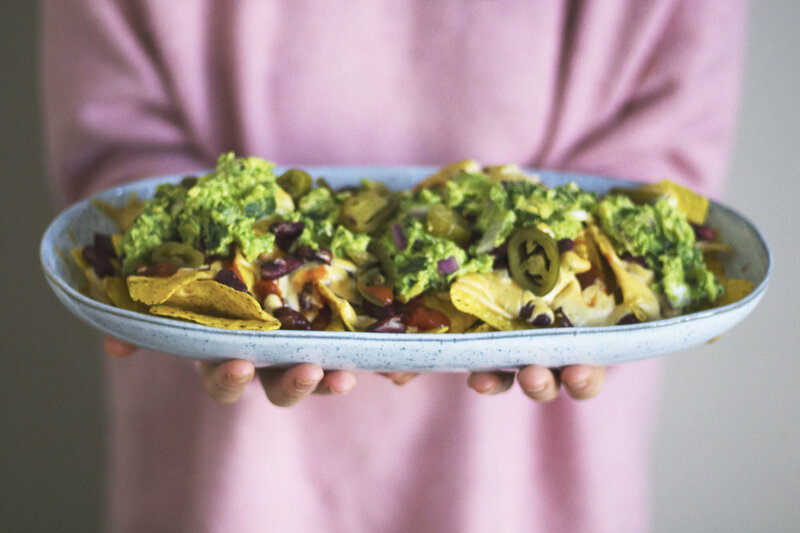 On a large dish, pour around half of the nachos and top with salsa, kidney beans and the cashew cheese. Layer up one more time, or until the nachos are all gone. Bake in oven for 5-10 minutes, or until golden brown. Remove from the oven and top with guacamole and jalapenos. Serve warm. Got extra time? Replace the kidney beans with my chilli sin carne recipe. Use any extra cashew cheese as a delicious dip for crisps or bread.